With the penetration of the internet and increasing popularity of digital platforms, digital advertising has grown to become one of the most important forms of advertising. Digital advertising revenue worldwide is forecast to increase at a fast pace in the coming years. Nearly 170 billion U.S. dollars were spent on digital advertising in 2015. By 2021, this figure is projected to add up to more than 330 billion U.S. dollars. The United States is the largest digital advertising market in the world, as the country had the highest revenue in the digital advertising market in 2016 – an estimate of 80 billion U.S. dollars. About a quarter of all ad expenditures in the country were devoted to digital advertising. 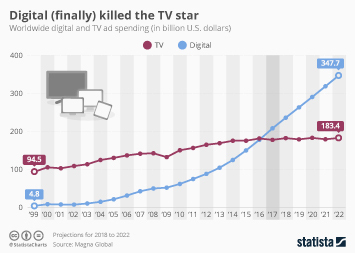 Digital advertising spending in the U.S. is projected to grow in the next few years, as sources expect the total spending on digital advertising to reach nearly 93.5 billion U.S. dollars by 2020. In terms of industries, the retail industry invests the most on digital advertising in the country. As of 2016, this particular industry accounted for 22 percent of all digital advertising spending in the U.S. The automotive and the financial services industry held about 12 percent of the share each. Search advertising is the most profitable and most promising digital ad format in the U.S., accounting for the majority of the digital advertising revenue generated in the country. Considering search advertising is one of the major revenue streams for digital advertisers, it is no surprise Google, the leading search engine in the world, has by far the highest net digital advertising revenue amongst online companies in the U.S., with healthy growth projections for the future. While Google generated about 80 billion U.S. dollars in revenue through its digital advertising channels, Facebook’s digital revenue stood at 27 billion U.S. dollars. In the United States, Facebook leads the display advertising market though, leaving Google and other competitors behind. The use of mobile for advertising is also a growing trend in the country, as mobile is forecast to become the main device for digital advertisers by 2017. Full-screen interactive ad formats on smartphones have the highest recall rate in the country already; 58 percent of American internet users remember those ads. When this type of ad was encountered on a desktop device, for instance, only 38 percent of internet users stated remembering the ad. Brand advertising recall rate for full-screen interactive ads displayed on tablet and smartphone is also high in comparison to other formats. Another advantage of using mobile ads is lower ad blocking software use on mobile devices amongst American internet users. Whereas 17.7 percent of internet users in the U.S. use ad blocking software on their laptop or desktop computer, only 9.6 percent used on their mobile devices.